Our reception is open 24 hours a day. It provides you with all the information, services and queries you may need during your stay. 24 hours a day this is the chill and relax spot. Grab a coffee or bloody Mary to wake up, then sit around chatting with new friends or catch up with old ones. Our 24 Reception Bar provides a full range of alcoholic and non-alcoholic drinks, snacks and general goods. 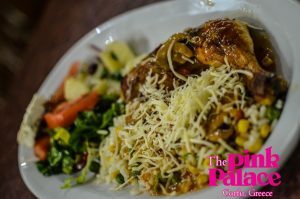 The Palladium restaurant is a unique place to eat with views to the sea and to Agios Gordios during the sunset. The food is served for you – not buffet service. 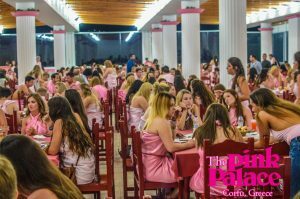 After dinner is when the nightlife comes alive – Toga Parties, Beer Pong, Pajama parties; every night has something different to offer. The Palladium is our onsite nightclub. Drink, party, dance and socialize – the Palladium is the place to let your hair down and go crazy with our live in house DJ. The Palladium Nightclub is big, with a 22 metre bar. Graced with a simple, open-plan design, you’ll be sure to have plenty of room to drink and dance. 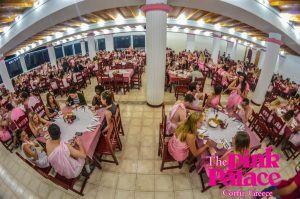 With a fully stocked bar, seating overlooking the sea, direct beach access, super large Jacuzzi, beach kitchen, activities and happy hour(s), this is the daytime hub at The Pink Palace. The beach bar kitchen is open for food all day long. Start the day off with a full buffet-style breakfast in our Beach Bar Restaurant. Breakfast consists of toast, ham, cheese , fried, poached or boiled eggs, bacon, omelette, pepperoni, yogurt, cereal and more. 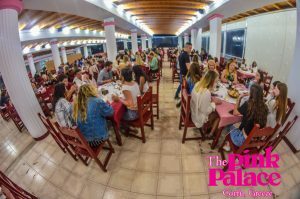 With FREE Wi- Fi, sun beds, plenty of seating and an amazing view and you realize the Pink Palace Beach Bar Restaurant is the perfect place to relax and socialize. Watch out for Happy Hour – our already low drinks prices get even lower ! Get into the vibe before dinner and watch the sun begin to descend over the Ionian sea. The Beach Bar also serves as the starting point for our Pink Palace Booze Cruise, Ouzo Cup Volleyball and Kayaking Safari and rentals. The Beach Bar Restaurant becomes your home for daytime activities which has free basketball and volleyball courts and of course our beautiful beach. A favourite location for many of our guests is the Pool Side Jaccuzi. With the bar, restaurant and volleyball court and half sized basketball court close to hand, the Jacuzzi is a great place to chill and let the bubbles do their work.With plenty of sun loungers and umbrellas around the pool area, this is a great place to get a tan. 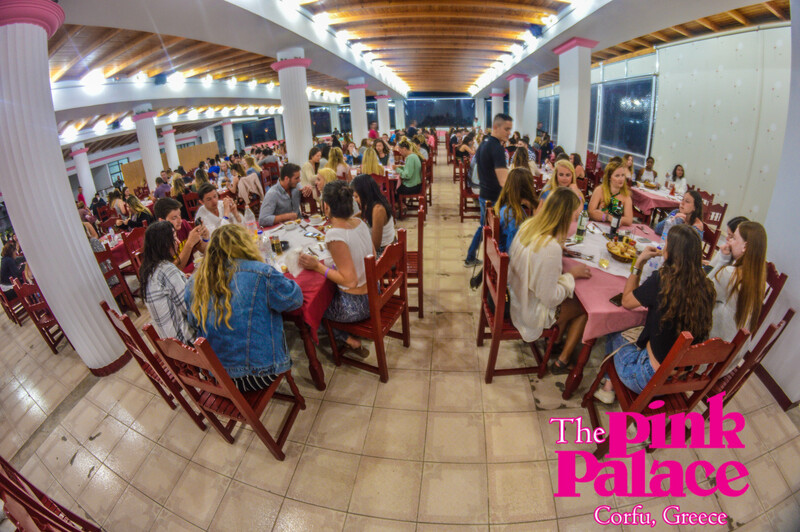 The Pink Palace Roof Terrace is the ideal quiet location for sun worshippers and those who want to simply chill, have a quiet drink, relax or read a book. It is also the best place watch the sunset across the Ionian sea. You have a choice of seating including sun loungers, chairs and tables, as well as plenty of umbrellas to shade the midday sun.